running one mile to a marathon overnight. You’d work to increase your mileage, better understand the proper form to running that length of race, test out nutrition and much more. I feel the same way about quilting. That’s why I made a goal of making a mini quilt for four good quilty friends. Minis are a great way to work on skill building. I also feel it’s a confidence booster because you get to see a project through from the start to finish in (usually) a much faster time frame than a large quilt. I challenged myself to find really fun patterns that matched interests of these particular friends. I had a feeling that by focusing on something they’d like first that it would work out that I’d end up practicing different skills. I ended up choosing Big Game (the mini) by Emily Herrick Designs, Lisa the Unicorn (the “pillow” size that made a great mini) by Elizabeth Hartman, Sewing Machine by Quiet Play and then I used the Rose pattern from Jitka Design and made my own mini quilt out of the roses. In Big Game, the big focus for me was working on free motion quilting (fmq). I am scared of fmq, so stepping out of my comfort zone is important to building up all my quilting skills. FMQ was absolutely essential in this pattern because you can’t really applique the antlers. They are so small that the thread would end up covering the entire antler. So, I did a very dense meandering pattern using variegated pink thread. I love the result! My friend loves the outdoors, her family has many hunter enthusiasts and she loves pink. For Lisa the Unicorn, my goal was to work slowly. Sometimes I'm in a hurry (hey, I only have so many minutes a day to spend sewing!) and I see that hurriedness reflected sometimes in my finished piece. For this mini, I tried to work on piecing accuracy as well as pressing all seams open. Since I typically spend a lot of time making quilts with hundreds of squares that need to be nested (necessitating pressing to opposite sides), this was an opportunity to work on pressing open those seams to get a nice flat finish. I also did echo quilting on this mini, something I don’t often do. I really enjoyed working on this mini! My friend is obsessed with unicorns and has a tie to the color red, so it was easy to pick a direction for her. With the Sewing Machine mini, I was excited to skill build with paper piecing. I always appreciate the time I spend working on a paper pieced pattern and feel like I improve just a tiny bit every time. I also worked on pressing as many seams open as possible. I also flexed by creative muscle and called upon the Instagram quilting community to help me expand this mini. I wanted it slightly larger and to use more color, so I added a colorful inner border to the pattern. I did some very basic straight line stitching but added in a teeny spot of fmq as my friend would appreciate that. I am really excited with how it turned out! My friend is certified in working on old sewing machines and I knew this was the perfect pattern! While older machines tend to be black, I tied in her modern roots with her knowledge and skills with older machines. For the Roses mini, I knew instantly the direction to go for my friend (roses!) but could not find a mini pattern to use. Instead, I found this fantastic paper pieced rose (a free pattern!). I knew I would keep it simple and classic by using nine roses and separating with some simple sashing. Again, I had the opportunity to work on my paper piecing skills – and some of these were very tiny pieces! I also loved that since this is a free pattern, there are no directions so I had to figure out all sizes to cut myself and I had no issues. That was a great skill building activity for me so that as I work on paper piecing designs, I know how to measure for myself to give cutting directions. For this quilt, I also did a mix of machine quilting and big stitch hand quilting (on the roses). I had some issue with my machine quilting (gggrrrr!) but loved the overall outcome. And I know my gracious friend loves it too – flaws and all. I am so happy I found a way to make a mini using something my friend really likes! 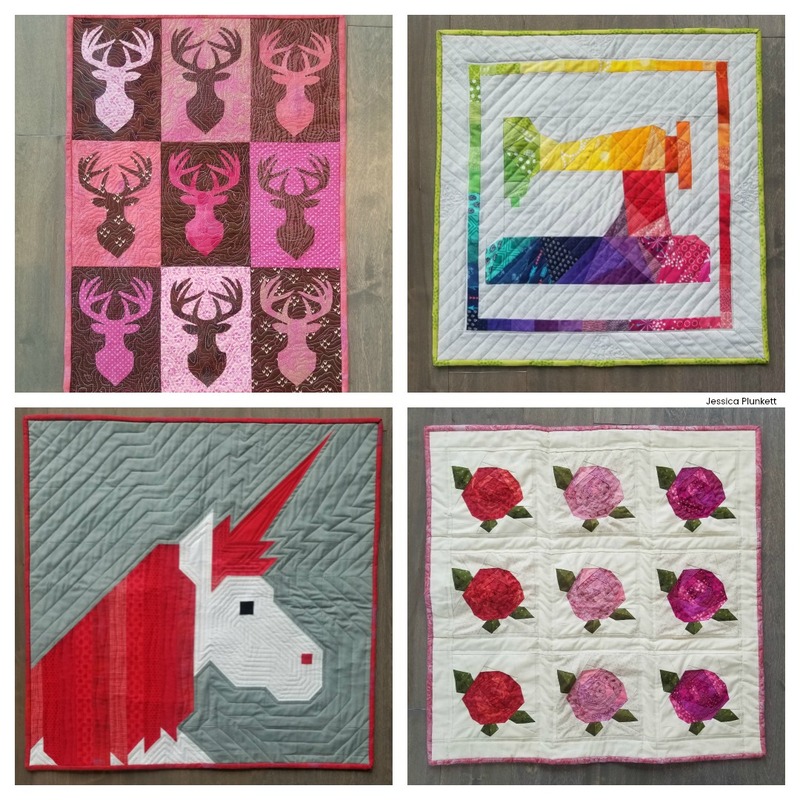 Overall, I loved mini quilt mission – I feel accomplished seeing four quilts from start to finish over a couple month period of time. I also really enjoyed the skill building exercise and saw improvements in little things and big things alike. I plan to continue my mini mission by setting aside some time every few months to make a mini for someone. Do you like making minis? How do you work on quilting skill building?